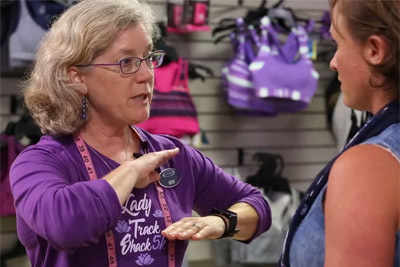 Girls' Nights Out for Runners and Walkers! The week of January 21 – January 26 is set aside in Track Shack as Lady Track Shack 5k Week with events, activities and excitement leading up to the 42nd AdventHeath Lady Track Shack 5k Run and Walk! Getting fit and feeling good is the overarching theme with opportunities to do yoga, learn foam rolling techniques, or get an expert bra fitting to make exercising more comfortable. Then on Saturday we’ll unite as a community of lady runners and walkers to help fund mammograms for local women. Bra Fitting Night at 5:00 pm, with expert bra fitters from Brooks, wine and cheese! Ladies receive 15% off in-stock bras. Mark your calendar to take part in events that celebrate your healthy and active lifestyle!